Reel Physics: Goldeneye - Dam, that's a stretch! Jason and Colby consider James Bond's bungee jumping career. Hey everyone, it's time to visit James Bond again... but we're going back one Bond to the Brosnan era! 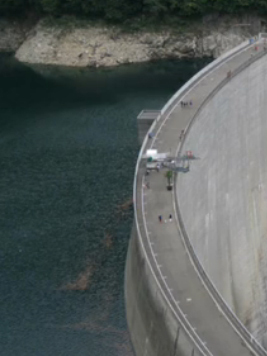 So let's check out the dam bungee jump scene from Goldeneye! This was another fun one to do and I hope you guys enjoy it! If you missed Speed last week, be sure you go back and watch it. We did something a bit different so as not to retread a lot of the same territory as everyone else. It's definitely worth watching even if you think you knew what the outcome would be. As always, we are trying to help grow our audience, so if you guys like our show and want it to continue, please share it out on your Facebook feeds, tweet it out to all of your followers, tell your friends, family and co-workers about it... and overall, just spread the word. We have a great time making the show and want to introduce it to as many people as we can. Thanks again for your support of the show! Wait, there's still something I'm not clear on. You said the bungie cord could only stretch so far, but he stretches it further with the grappling hook, how would that work? Did I miss something? The dam is about 220m tall, and it looks like he's pulling himself down no more than 20m, so the total force after he pulls himself down is definitely less than 20% higher than what they gave (force is kx Newtons, with x=0 at the equilibrium position - I'd need to check the video to see where exactly that is). yes, it can only stretch so far, but most bungie cords are designed to come no where near that limit for safety reasons (roughly 30-50% of the point of failure at the max) to give maximum capability of stretch without any chance of breaking the cord. Even if it was put to a point of 80% it would still be within tolerances to allow getting to the bottom. All i can say is, Dude, Heavy. i have to think up another good one for you guys... hmm. Oh ok. I guess that makes sense. Must be one hell of a powerful grappling hook though. I like the added (scripted or not) comedy in the episodes. It might be distracting for the folks trying to follow the math, but since I don't understand any of that stuff I like the added knob-jokes! I finally thought of a scene that might be interesting to do some calculations on, though not so much a reel/real question as a "what would it take" question. In Cloverfield(2008) at some point the monster hits the head of the statue of Liberty and it lands somewhere in Manhattan, what kind of force would be needed to do something like that. Sheer of the head, bat it several miles(?) away, would it even resemble a head any more after a hit like that? Whoa, this episode was pretty damned punny. I really like how I learn new things from your episodes that I actually can understand! Like how the bungie jump was an actual stunt... 170m!! SHITFUC*!!! I have seen all of your episodes and this show is awesome. It's great how you guys are getting people interested in physics by using pop culture. At the end of this episode you were trying to figure out if it was farther or further and since we are talking about a physical distance that Bond has to pull himself down the word used is farther. If it were anything other than a physical distance, like say Bond needed to summon the will to make it that extra distance, further would be the word used. I liked this one a lot more than many of the other episodes, where a lot of leeway is given. Rather than have a bunch of caveats and assumptions, this takes just the scene for it's face value and renders a verdict- with a bonus being that it's plausible, err... Real Physics. Keep 'em coming fellas. I actually understood this. I think, only thanks to other things I learned at Reel Physics. Agh if only I had a physics teacher 10% as capable as these guys. Anyway how about scene in space, with vacuum and stuff? Or some crash landing on Mars or something? On the episode: Another good one! All that math goes right by me. I will give you this, you have improved on your explaining methods on screen. Wish yall would have taught me this stuff in high school, instead of the incompetent assess we got. I find the tiny grapple managing to hold in to be the real problem in this scene, myself. While certain wire types could definately hold that, I'm doubting the hook itself has enough grip to stay in place. Of course, that'd be analyzing a bond gadget, which is like trying to physics up Star wars. Couldn't you guys get in trouble for using Jared Fogles image? Or is it in the public domain? Just in case you're actually interested, someone has actually managed to figure out how much energy Yoda outputs. It was a pretty fun episode. 1st: How long would it take for the protagonist to pass out from the heat and/or smoke? 2nd: Using the answer to question one, if the protagonist attempted to break free from the structure would they be able to before collapsing from the flames? 3rd: Also depending on question one, would the body of the wickerman stay upright long enough for the protagonist to pass-out from heat/smoke? It's a bit of a morbid request, but I am curious of the mathematics of it. You misspelt "Dam", it should have been "Damn"
Jason: What is the drag coefficient of a brick? Colby: Turns out YOU SHOULD ALREADY KNOW THIS! Yeah, the gun is a complete work of fiction. The claw would need to be able to dig in far deeper than it did in the movie and the motor would need to be a fair bit larger to supply enough torque. Mythbusters tried it before using batman's grapple as the template which is along similar designs to the bond one. OT: Haven't watched the video as I hit my bandwidth limit a few days ago which makes watching videos impossible, but can I infer from everyone's comments that this is in fact "real" physics? I always watched that scene thinking that in real life he'd bang up against the sides and die. It's been a while, but was there a reason aside from awesomeness why Bond bungie-jumped off the dam instead of repelling down it? just recently i was watching wild wild west with will smith. one scene that really breaks the law of physics is the scene were he was lying on a board the rails, trying to roll under the train following them. but the metal rode ripped and he was rolling under the train following them. using a rubber rope that made him roll back and forwards, he managed to jumping off that board, landing on the back of the train. hope this helps which scene i mean. cant find it on youtube. That, that is going on a T-shirt. It's real physics, because they really did it, off of an actual dam! If there was an implausible scene in that film, it was him jumping off the runway into the prop jobber and flying away. Wish we could have seen that one done. Not to diminish your work at all, guys, cause it's a great episode as always. Unless they do what most bungee enthusiasts do when they jump off a fixed structure, which is to jump off a platform which protrudes sufficiently from the fixed structure to avoid precisely what you mentioned. Something a bit like you see in this actual video. And the out-takes are a great part of the show, and really funny. I love this show, its growing fast to become one of my favorite on the Escapist. Thanks you guys for the confirmation =) I'll make sure to watch it once May 1 rolls around!